"Not long ago," said he at length, "and I could have guided you on this route as well as the youngest of my sons ; but, about three years past, there happened to me an event such as never happened to mortal man - or at least such as no man ever survived to tell of - and the six hours of deadly terror which I then endured have broken me up body and soul. You suppose me a very old man - but I am not. It took less than a single day to change these hairs from a jetty black to white, to weaken my limbs, and to unstring my nerves, so that I tremble at the least exertion, and am frightened at a shadow. Do you know I can scarcely look over this little cliff without getting giddy ?" The "little cliff," upon whose edge he had so carelessly thrown himself down to rest that the weightier portion of his body hung over it, while he was only kept from falling by the tenure of his elbow on its extreme and slippery edge - this "little cliff" arose, a sheer unobstructed precipice of black shining rock, some fifteen or sixteen hundred feet from the world of crags beneath us. Nothing would have tempted me to within half a dozen yards of its brink. In truth so deeply was I excited by the perilous position of my companion, that I fell at full length upon the ground, clung to the shrubs around me, and dared not even glance upward at the sky - while I struggled in vain to divest myself of the idea that the very foundations of the mountain were in danger from the fury of the winds. It was long before I could reason myself into sufficient courage to sit up and look out into the distance. "You must get over these fancies," said the guide, "for I have brought you here that you might have the best possible view of the scene of that event I mentioned - and to tell you the whole story with the spot just under your eye." "We are now," he continued, in that particularizing manner which distinguished him - "we are now close upon the Norwegian coast - in the sixty-eighth degree of latitude - in the great province of Nordland - and in the dreary district of Lofoden. The mountain upon whose top we sit is Helseggen, the Cloudy. Now raise yourself up a little higher - hold on to the grass if you feel giddy - so - and look out, beyond the belt of vapor beneath us, into the sea." I looked dizzily, and beheld a wide expanse of ocean, whose waters wore so inky a hue as to bring at once to my mind the Nubian geographer's account of the Mare Tenebrarum . A panorama more deplorably desolate no human imagination can conceive. To the right and left, as far as the eye could reach, there lay outstretched, like ramparts of the world, lines of horridly black and beetling cliff, whose character of gloom was but the more forcibly illustrated by the surf which reared high up against its white and ghastly crest, howling and shrieking forever. Just opposite the promontory upon whose apex we were placed, and at a distance of some five or six miles out at sea, there was visible a small, bleak-looking island ; or, more properly, its position was discernible through the wilderness of surge in which it was enveloped. About two miles nearer the land, arose another of smaller size, hideously craggy and barren, and encompassed at various intervals by a cluster of dark rocks. The appearance of the ocean, in the space between the more distant island and the shore, had something very unusual about it. Although, at the time, so strong a gale was blowing landward that a brig in the remote offing lay to under a double-reefed trysail, and constantly plunged her whole hull out of sight, still there was here nothing like a regular swell, but only a short, quick, angry cross dashing of water in every direction - as well in the teeth of the wind as otherwise. Of foam there was little except in the immediate vicinity of the rocks. "The island in the distance," resumed the old man, "is called by the Norwegians Vurrgh. The one midway is Moskoe. That a mile to the northward is Ambaaren. Yonder are Islesen, Hotholm, Keildhelm, Suarven, and Buckholm. Farther off - between Moskoe and Vurrgh - are Otterholm, Flimen, Sandflesen, and Stockholm. These are the true names of the places - but why it has been thought necessary to name them at all, is more than either you or I can understand. Do you hear anything ? Do you see any change in the water ?" We had now been about ten minutes upon the top of Helseggen, to which we had ascended from the interior of Lofoden, so that we had caught no glimpse of the sea until it had burst upon us from the summit. As the old man spoke, I became aware of a loud and gradually increasing sound, like the moaning of a vast herd of buffaloes upon an American prairie; and at the same moment I perceived that what seamen term the chopping character of the ocean beneath us, was rapidly changing into a current which set to the eastward. Even while I gazed, this current acquired a monstrous velocity. Each moment added to its speed - to its headlong impetuosity. In five minutes the whole sea, as far as Vurrgh, was lashed into ungovernable fury ; but it was between Moskoe and the coast that the main uproar held its sway. Here the vast bed of the waters, seamed and scarred into a thousand conflicting channels, burst suddenly into phrensied convulsion - heaving, boiling, hissing - gyrating in gigantic and innumerable vortices, and all whirling and plunging on to the eastward with a rapidity which water never elsewhere assumes except in precipitous descents. In a few minutes more, there came over the scene another radical alteration. The general surface grew somewhat more smooth, and the whirlpools, one by one, disappeared, while prodigious streaks of foam became apparent where none had been seen before. These streaks, at length, spreading out to a great distance, and entering into combination, took unto themselves the gyratory motion of the subsided vortices, and seemed to form the germ of another more vast. Suddenly - very suddenly - this assumed a distinct and definite existence, in a circle of more than a mile in diameter. The edge of the whirl was represented by a broad belt of gleaming spray ; but no particle of this slipped into the mouth of the terrific funnel, whose interior, as far as the eye could fathom it, was a smooth, shining, and jet-black wall of water, inclined to the horizon at an angle of some forty-five degrees, speeding dizzily round and round with a swaying and sweltering motion, and sending forth to the winds an appalling voice, half shriek, half roar, such as not even the mighty cataract of Niagara ever lifts up in its agony to Heaven. 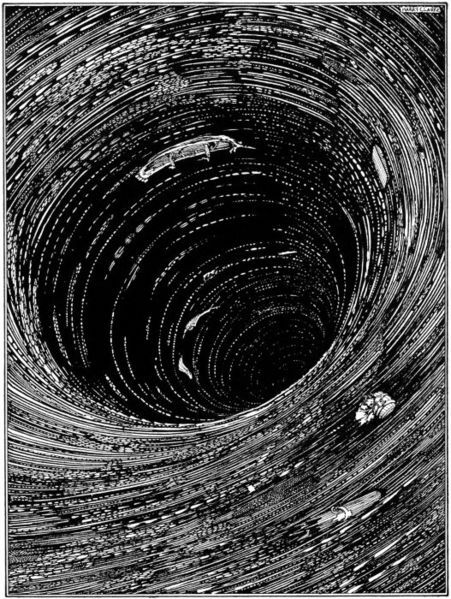 "This," said I at length, to the old man - "this can be nothing else than the great whirlpool of the Maelstrm." "So it is sometimes termed," said he. "We Norwegians call it the Moskoe-strm, from the island of Moskoe in the midway." The ordinary accounts of this vortex had by no means prepared me for what I saw. That of Jonas Ramus, which is perhaps the most circumstantial of any, cannot impart the faintest conception either of the magnificence, or of the horror of the scene - or of the wild bewildering sense of the novel which confounds the beholder. I am not sure from what point of view the writer in question surveyed it, nor at what time ; but it could neither have been from the summit of Helseggen, nor during a storm. There are some passages of his description, nevertheless, which may be quoted for their details, although their effect is exceedingly feeble in conveying an impression of the spectacle. "Between Lofoden and Moskoe," he says, "the depth of the water is between thirty-six and forty fathoms ; but on the other side, toward Ver (Vurrgh) this depth decreases so as not to afford a convenient passage for a vessel, without the risk of splitting on the rocks, which happens even in the calmest weather. When it is flood, the stream runs up the country between Lofoden and Moskoe with a boisterous rapidity ; but the roar of its impetuous ebb to the sea is scarce equalled by the loudest and most dreadful cataracts ; the noise being heard several leagues off, and the vortices or pits are of such an extent and depth, that if a ship comes within its attraction, it is inevitably absorbed and carried down to the bottom, and there beat to pieces against the rocks ; and when the water relaxes, the fragments thereof are thrown up again. But these intervals of tranquility are only at the turn of the ebb and flood, and in calm weather, and last but a quarter of an hour, its violence gradually returning. When the stream is most boisterous, and its fury heightened by a storm, it is dangerous to come within a Norway mile of it. Boats, yachts, and ships have been carried away by not guarding against it before they were within its reach. It likewise happens frequently, that whales come too near the stream, and are overpowered by its violence; and then it is impossible to describe their howlings and bellowings in their fruitless struggles to disengage themselves. A bear once, attempting to swim from Lofoden to Moskoe, was caught by the stream and borne down, while he roared terribly, so as to be heard on shore. Large stocks of firs and pine trees, after being absorbed by the current, rise again broken and torn to such a degree as if bristles grew upon them. This plainly shows the bottom to consist of craggy rocks, among which they are whirled to and fro. This stream is regulated by the flux and reflux of the sea - it being constantly high and low water every six hours. In the year 1645, early in the morning of Sexagesima Sunday, it raged with such noise and impetuosity that the very stones of the houses on the coast fell to the ground." In regard to the depth of the water, I could not see how this could have been ascertained at all in the immediate vicinity of the vortex. The "forty fathoms" must have reference only to portions of the channel close upon the shore either of Moskoe or Lofoden. The depth in the centre of the Moskoe-strm must be immeasurably greater ; and no better proof of this fact is necessary than can be obtained from even the sidelong glance into the abyss of the whirl which may be had from the highest crag of Helseggen. Looking down from this pinnacle upon the howling Phlegethon below, I could not help smiling at the simplicity with which the honest Jonas Ramus records, as a matter difficult of belief, the anecdotes of the whales and the bears; for it appeared to me, in fact, a self-evident thing, that the largest ship of the line in existence, coming within the influence of that deadly attraction, could resist it as little as a feather the hurricane, and must disappear bodily and at once. The attempts to account for the phenomenon - some of which, I remember, seemed to me sufficiently plausible in perusal - now wore a very different and unsatisfactory aspect. The idea generally received is that this, as well as three smaller vortices among the Ferroe islands, "have no other cause than the collision of waves rising and falling, at flux and reflux, against a ridge of rocks and shelves, which confines the water so that it precipitates itself like a cataract ; and thus the higher the flood rises, the deeper must the fall be, and the natural result of all is a whirlpool or vortex, the prodigious suction of which is sufficiently known by lesser experiments." - These are the words of the Encyclopdia Britannica. Kircher and others imagine that in the centre of the channel of the Maelstrm is an abyss penetrating the globe, and issuing in some very remote part - the Gulf of Bothnia being somewhat decidedly named in one instance. This opinion, idle in itself, was the one to which, as I gazed, my imagination most readily assented ; and, mentioning it to the guide, I was rather surprised to hear him say that, although it was the view almost universally entertained of the subject by the Norwegians, it nevertheless was not his own. As to the former notion he confessed his inability to comprehend it ; and here I agreed with him - for, however conclusive on paper, it becomes altogether unintelligible, and even absurd, amid the thunder of the abyss. "You have had a good look at the whirl now," said the old man, "and if you will creep round this crag, so as to get in its lee, and deaden the roar of the water, I will tell you a story that will convince you I ought to know something of the Moskoe-strm." "Myself and my two brothers once owned a schooner-rigged smack of about seventy tons burthen, with which we were in the habit of fishing among the islands beyond Moskoe, nearly to Vurrgh. In all violent eddies at sea there is good fishing, at proper opportunities, if one has only the courage to attempt it ; but among the whole of the Lofoden coastmen, we three were the only ones who made a regular business of going out to the islands, as I tell you. The usual grounds are a great way lower down to the southward. There fish can be got at all hours, without much risk, and therefore these places are preferred. The choice spots over here among the rocks, however, not only yield the finest variety, but in far greater abundance ; so that we often got in a single day, what the more timid of the craft could not scrape together in a week. In fact, we made it a matter of desperate speculation - the risk of life standing instead of labor, and courage answering for capital. "We kept the smack in a cove about five miles higher up the coast than this ; and it was our practice, in fine weather, to take advantage of the fifteen minutes' slack to push across the main channel of the Moskoe-strm, far above the pool, and then drop down upon anchorage somewhere near Otterholm, or Sandflesen, where the eddies are not so violent as elsewhere. Here we used to remain until nearly time for slack-water again, when we weighed and made for home. We never set out upon this expedition without a steady side wind for going and coming - one that we felt sure would not fail us before our return - and we seldom made a mis-calculation upon this point. Twice, during six years, we were forced to stay all night at anchor on account of a dead calm, which is a rare thing indeed just about here ; and once we had to remain on the grounds nearly a week, starving to death, owing to a gale which blew up shortly after our arrival, and made the channel too boisterous to be thought of. Upon this occasion we should have been driven out to sea in spite of everything, (for the whirlpools threw us round and round so violently, that, at length, we fouled our anchor and dragged it) if it had not been that we drifted into one of the innumerable cross currents - here to-day and gone to-morrow - which drove us under the lee of Flimen, where, by good luck, we brought up. "I could not tell you the twentieth part of the difficulties we encountered 'on the grounds' - it is a bad spot to be in, even in good weather - but we made shift always to run the gauntlet of the Moskoe-strm itself without accident ; although at times my heart has been in my mouth when we happened to be a minute or so behind or before the slack. The wind sometimes was not as strong as we thought it at starting, and then we made rather less way than we could wish, while the current rendered the smack unmanageable. My eldest brother had a son eighteen years old, and I had two stout boys of my own. These would have been of great assistance at such times, in using the sweeps, as well as afterward in fishing - but, somehow, although we ran the risk ourselves, we had not the heart to let the young ones get into the danger - for, after all is said and done, it was a horrible danger, and that is the truth. "It is now within a few days of three years since what I am going to tell you occurred. It was on the tenth day of July, 18-, a day which the people of this part of the world will never forget - for it was one in which blew the most terrible hurricane that ever came out of the heavens. And yet all the morning, and indeed until late in the afternoon, there was a gentle and steady breeze from the south-west, while the sun shone brightly, so that the oldest seaman among us could not have foreseen what was to follow. "The three of us - my two brothers and myself - had crossed over to the islands about two o'clock P. M., and had soon nearly loaded the smack with fine fish, which, we all remarked, were more plenty that day than we had ever known them. It was just seven, by my watch , when we weighed and started for home, so as to make the worst of the Strm at slack water, which we knew would be at eight. "We set out with a fresh wind on our starboard quarter, and for some time spanked along at a great rate, never dreaming of danger, for indeed we saw not the slightest reason to apprehend it. All at once we were taken aback by a breeze from over Helseggen. This was most unusual - something that had never happened to us before - and I began to feel a little uneasy, without exactly knowing why. We put the boat on the wind, but could make no headway at all for the eddies, and I was upon the point of proposing to return to the anchorage, when, looking astern, we saw the whole horizon covered with a singular copper-colored cloud that rose with the most amazing velocity. "Our boat was the lightest feather of a thing that ever sat upon water. It had a complete flush deck, with only a small hatch near the bow, and this hatch it had always been our custom to batten down when about to cross the Strm, by way of precaution against the chopping seas. But for this circumstance we should have foundered at once - for we lay entirely buried for some moments. How my elder brother escaped destruction I cannot say, for I never had an opportunity of ascertaining. For my part, as soon as I had let the foresail run, I threw myself flat on deck, with my feet against the narrow gunwale of the bow, and with my hands grasping a ring-bolt near the foot of the fore-mast. It was mere instinct that prompted me to do this - which was undoubtedly the very best thing I could have done - for I was too much flurried to think. "No one ever will know what my feelings were at that moment. I shook from head to foot as if I had had the most violent fit of the ague. I knew what he meant by that one word well enough - I knew what he wished to make me understand. With the wind that now drove us on, we were bound for the whirl of the Strm, and nothing could save us ! "You perceive that in crossing the Strm channel, we always went a long way up above the whirl, even in the calmest weather, and then had to wait and watch carefully for the slack - but now we were driving right upon the pool itself, and in such a hurricane as this! 'To be sure,' I thought, 'we shall get there just about the slack - there is some little hope in that' - but in the next moment I cursed myself for being so great a fool as to dream of hope at all. I knew very well that we were doomed, had we been ten times a ninety-gun ship. "At first I could not make out what he meant - but soon a hideous thought flashed upon me. I dragged my watch from its fob. It was not going. I glanced at its face by the moonlight, and then burst into tears as I flung it far away into the ocean. It had run down at seven o'clock! We were behind the time of the slack, and the whirl of the Strm was in full fury! "When a boat is well built, properly trimmed, and not deep laden, the waves in a strong gale, when she is going large, seem always to slip from beneath her - which appears very strange to a landsman - and this is what is called riding, in sea phrase. Well, so far we had ridden the swells very cleverly ; but presently a gigantic sea happened to take us right under the counter, and bore us with it as it rose - up - up - as if into the sky. I would not have believed that any wave could rise so high. And then down we came with a sweep, a slide, and a plunge, that made me feel sick and dizzy, as if I was falling from some lofty mountain-top in a dream. But while we were up I had thrown a quick glance around - and that one glance was all sufficient. I saw our exact position in an instant. The Moskoe-Strm whirlpool was about a quarter of a mile dead ahead - but no more like the every-day Moskoe-Strm, than the whirl as you now see it is like a mill-race. If I had not known where we were, and what we had to expect, I should not have recognised the place at all. As it was, I involuntarily closed my eyes in horror. The lids clenched themselves together as if in a spasm. "It could not have been more than two minutes afterward until we suddenly felt the waves subside, and were enveloped in foam. The boat made a sharp half turn to larboard, and then shot off in its new direction like a thunderbolt. At the same moment the roaring noise of the water was completely drowned in a kind of shrill shriek - such a sound as you might imagine given out by the waste-pipes of many thousand steam-vessels, letting off their steam all together. We were now in the belt of surf that always surrounds the whirl ; and I thought, of course, that another moment would plunge us into the abyss - down which we could only see indistinctly on account of the amazing velocity with which we wore borne along. The boat did not seem to sink into the water at all, but to skim like an air-bubble upon the surface of the surge. Her starboard side was next the whirl, and on the larboard arose the world of ocean we had left. It stood like a huge writhing wall between us and the horizon. "It may look like boasting - but what I tell you is truth - I began to reflect how magnificent a thing it was to die in such a manner, and how foolish it was in me to think of so paltry a consideration as my own individual life, in view of so wonderful a manifestation of God's power. I do believe that I blushed with shame when this idea crossed my mind. After a little while I became possessed with the keenest curiosity about the whirl itself. I positively felt a wish to explore its depths, even at the sacrifice I was going to make ; and my principal grief was that I should never be able to tell my old companions on shore about the mysteries I should see. These, no doubt, were singular fancies to occupy a man's mind in such extremity - and I have often thought since, that the revolutions of the boat around the pool might have rendered me a little light-headed. "There was another circumstance which tended to restore my self-possession ; and this was the cessation of the wind, which could not reach us in our present situation - for, as you saw yourself, the belt of surf is considerably lower than the general bed of the ocean, and this latter now towered above us, a high, black, mountainous ridge. If you have never been at sea in a heavy gale, you can form no idea of the confusion of mind occasioned by the wind and spray together. They blind, deafen, and strangle you, and take away all power of action or reflection. But we were now, in a great measure, rid of these annoyances - just us death-condemned felons in prison are allowed petty indulgences, forbidden them while their doom is yet uncertain. "How often we made the circuit of the belt it is impossible to say. We careered round and round for perhaps an hour, flying rather than floating, getting gradually more and more into the middle of the surge, and then nearer and nearer to its horrible inner edge. All this time I had never let go of the ring-bolt. My brother was at the stern, holding on to a small empty water-cask which had been securely lashed under the coop of the counter, and was the only thing on deck that had not been swept overboard when the gale first took us. As we approached the brink of the pit he let go his hold upon this, and made for the ring, from which, in the agony of his terror, he endeavored to force my hands, as it was not large enough to afford us both a secure grasp. I never felt deeper grief than when I saw him attempt this act - although I knew he was a madman when he did it - a raving maniac through sheer fright. I did not care, however, to contest the point with him. I knew it could make no difference whether either of us held on at all ; so I let him have the bolt, and went astern to the cask. This there was no great difficulty in doing ; for the smack flew round steadily enough, and upon an even keel - only swaying to and fro, with the immense sweeps and swelters of the whirl. Scarcely had I secured myself in my new position, when we gave a wild lurch to starboard, and rushed headlong into the abyss. I muttered a hurried prayer to God, and thought all was over. "At first I was too much confused to observe anything accurately. The general burst of terrific grandeur was all that I beheld. When I recovered myself a little, however, my gaze fell instinctively downward. In this direction I was able to obtain an unobstructed view, from the manner in which the smack hung on the inclined surface of the pool. She was quite upon an even keel - that is to say, her deck lay in a plane parallel with that of the water - but this latter sloped at an angle of more than forty-five degrees, so that we seemed to be lying upon our beam-ends. I could not help observing, nevertheless, that I had scarcely more difficulty in maintaining my hold and footing in this situation, than if we had been upon a dead level ; and this, I suppose, was owing to the speed at which we revolved. "The rays of the moon seemed to search the very bottom of the profound gulf ; but still I could make out nothing distinctly, on account of a thick mist in which everything there was enveloped, and over which there hung a magnificent rainbow, like that narrow and tottering bridge which Mussulmen say is the only pathway between Time and Eternity. This mist, or spray, was no doubt occasioned by the clashing of the great walls of the funnel, as they all met together at the bottom - but the yell that went up to the Heavens from out of that mist, I dare not attempt to describe. "Our first slide into the abyss itself, from the belt of foam above, had carried us a great distance down the slope ; but our farther descent was by no means proportionate. Round and round we swept - not with any uniform movement - but in dizzying swings and jerks, that sent us sometimes only a few hundred yards - sometimes nearly the complete circuit of the whirl. Our progress downward, at each revolution, was slow, but very perceptible. "Looking about me upon the wide waste of liquid ebony on which we were thus borne, I perceived that our boat was not the only object in the embrace of the whirl. Both above and below us were visible fragments of vessels, large masses of building timber and trunks of trees, with many smaller articles, such as pieces of house furniture, broken boxes, barrels and staves. I have already described the unnatural curiosity which had taken the place of my original terrors. It appeared to grow upon me as I drew nearer and nearer to my dreadful doom. I now began to watch, with a strange interest, the numerous things that floated in our company. I must have been delirious - for I even sought amusement in speculating upon the relative velocities of their several descents toward the foam below. 'This fir tree,' I found myself at one time saying, 'will certainly be the next thing that takes the awful plunge and disappears,' - and then I was disappointed to find that the wreck of a Dutch merchant ship overtook it and went down before. At length, after making several guesses of this nature, and being deceived in all - this fact - the fact of my invariable miscalculation - set me upon a train of reflection that made my limbs again tremble, and my heart beat heavily once more. "It was not a new terror that thus affected me, but the dawn of a more exciting hope. This hope arose partly from memory, and partly from present observation. I called to mind the great variety of buoyant matter that strewed the coast of Lofoden, having been absorbed and then thrown forth by the Moskoe-strm. By far the greater number of the articles were shattered in the most extraordinary way - so chafed and roughened as to have the appearance of being stuck full of splinters - but then I distinctly recollected that there were some of them which were not disfigured at all. Now I could not account for this difference except by supposing that the roughened fragments were the only ones which had been completely absorbed - that the others had entered the whirl at so late a period of the tide, or, for some reason, had descended so slowly after entering, that they did not reach the bottom before the turn of the flood came, or of the ebb, as the case might be. I conceived it possible, in either instance, that they might thus be whirled up again to the level of the ocean, without undergoing the fate of those which had been drawn in more early, or absorbed more rapidly. I made, also, three important observations. The first was, that, as a general rule, the larger the bodies were, the more rapid their descent - the second, that, between two masses of equal extent, the one spherical, and the other of any other shape , the superiority in speed of descent was with the sphere - the third, that, between two masses of equal size, the one cylindrical, and the other of any other shape, the cylinder was absorbed the more slowly. Since my escape, I have had several conversations on this subject with an old school-master of the district ; and it was from him that I learned the use of the words 'cylinder' and 'sphere.' He explained to me - although I have forgotten the explanation - how what I observed was, in fact, the natural consequence of the forms of the floating fragments - and showed me how it happened that a cylinder, swimming in a vortex, offered more resistance to its suction, and was drawn in with greater difficulty than an equally bulky body, of any form whatever. "I no longer hesitated what to do. I resolved to lash myself securely to the water cask upon which I now held, to cut it loose from the counter, and to throw myself with it into the water. I attracted my brother's attention by signs, pointed to the floating barrels that came near us, and did everything in my power to make him understand what I was about to do. I thought at length that he comprehended my design - but, whether this was the case or not, he shook his head despairingly, and refused to move from his station by the ring-bolt. It was impossible to reach him; the emergency admitted of no delay ; and so, with a bitter struggle, I resigned him to his fate, fastened myself to the cask by means of the lashings which secured it to the counter, and precipitated myself with it into the sea, without another moment's hesitation. "The result was precisely what I had hoped it might be. As it is myself who now tell you this tale - as you see that I did escape - and as you are already in possession of the mode in which this escape was effected, and must therefore anticipate all that I have farther to say - I will bring my story quickly to conclusion. It might have been an hour, or thereabout, after my quitting the smack, when, having descended to a vast distance beneath me, it made three or four wild gyrations in rapid succession, and, bearing my loved brother with it, plunged headlong, at once and forever, into the chaos of foam below. The barrel to which I was attached sunk very little farther than half the distance between the bottom of the gulf and the spot at which I leaped overboard, before a great change took place in the character of the whirlpool. The slope of the sides of the vast funnel became momently less and less steep. The gyrations of the whirl grew, gradually, less and less violent. By degrees, the froth and the rainbow disappeared, and the bottom of the gulf seemed slowly to uprise. The sky was clear, the winds had gone down, and the full moon was setting radiantly in the west, when I found myself on the surface of the ocean, in full view of the shores of Lofoden, and above the spot where the pool of the Moskoe-strm had been . It was the hour of the slack - but the sea still heaved in mountainous waves from the effects of the hurricane. I was borne violently into the channel of the Strm, and in a few minutes was hurried down the coast into the 'grounds' of the fishermen. A boat picked me up - exhausted from fatigue - and (now that the danger was removed) speechless from the memory of its horror. Those who drew me on board were my old mates and daily companions - but they knew me no more than they would have known a traveller from the spirit-land. My hair which had been raven-black the day before, was as white as you see it now. They say too that the whole expression of my countenance had changed. I told them my story - they did not believe it. I now tell it to you - and I can scarcely expect you to put more faith in it than did the merry fishermen of Lofoden." Add A Descent Into the Maelstrom to your own personal library.